Treasurer Scott Morrison has become Australia’s new Prime Minister after winning a Liberal party leadership vote. Mr Morrison won an internal ballot 45-40 over Peter Dutton (former Home Affairs Minister). Prime Minister Malcolm Turnbull did not contest the party ballot as he was under pressure from poor polling, a looming election, and a revolt by conservative MPs. Josh Frydenberg, the environment and energy minister, was selected as deputy Liberal leader. The Liberal party is the senior partner in the ruling conservative coalition that will face an election by May 2019. The Prime Minister of Australia is the head of government of Australia. 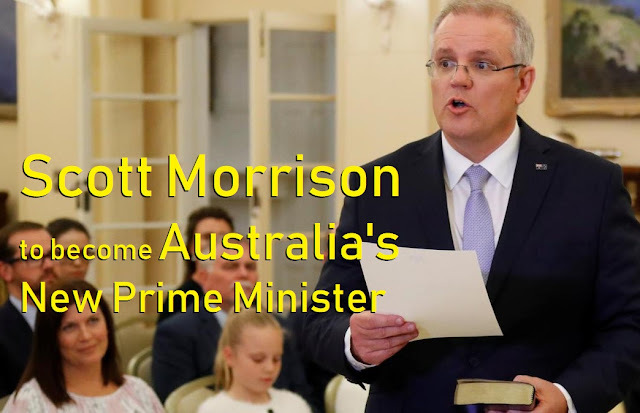 The Prime Minister of Australia is appointed by the Governor-General of Australia under Section 64 of the Australian Constitution. Russia with military contingents of the all eight SCO member nations participating in this exercise. The SCO Peace Mission Exercise is one of the major defence cooperation initiatives amongst SCO nations and will be a landmark event in the history of SCO defence cooperation. `On 15 June 2001, The Shanghai Cooperation Organization (SCO) is an intergovernmental organization founded in Shanghai by six countries (China, Kazakhstan, Kyrgyz Republic, Russia, Tajikistan, and Uzbekistan (from 9 June 2017 included India and Pakistan). Turkey requested dispute consultations on claims that the doubling of duties on steel and aluminium were inconsistent with international trade rules. The US has doubled the tariffs in response to Turkey's rejection of a request to release an American pastor detained for the past two years for alleged involvement in an abortive military coup. Turkey has retaliated by imposing tariffs on American products. Telangana State Government has increased the free electricity supply to the families of the Scheduled Castes (SC) and Scheduled Tribes (ST) for domestic purpose up to 101 units (earlier 50 Units). The state government will pay these charges to the dis distributary agencies. The state government also decided to increase the retirement age of Archakas in Temples to 65 years (current 58 years). India & Singapore have signed the 2nd Protocol amending the Comprehensive Economic Cooperation Agreement in New Delhi to boost bilateral trade. The Protocol was signed by Rajneesh, Joint Secretary, Ministry of Commerce and Industry and Francis Chong, Senior Director, Ministry of Trade and Industry, Government of Singapore. Both sides also agreed to expand the coverage of tariff concessions, liberalize the Rules of Origin, rationalize Product Specific Rules and include provisions on Certificate of Origin and Cooperation on its verification. It will offer true insight and a pitch-side seat to one of cricket’s finest eras, making this one of the ultimate must-have sports autobiographies. Shane Keith Warne is an Australian former international cricketer and a former ODI captain of the Australian national team. Warne was named one of the Wisden Cricketers of the Year in the 1994 Wisden Cricketers' Almanack. He officially retired from all formats of cricket in July 2013. According to SBI Chairman Rajnish Kumar, The State Bank of India has 'set its house in order' and the credit growth is expected to see 10% growth by the end of the current fiscal. The bank also bounces back into profits from the current quarter as the major chunk of provisioning for bad loans was done in the first quarter. The headcount would be 2.60 lakh by the end of this fiscal. The World Bank launched the world’s first bond ‘bond-i', to be created, allocated, transferred and managed by using distributed ledger technology. This two-year bond successfully raised USD 80.48 million. ICICI Bank has agreed to a multi-year partnership with Manchester United, bringing a range of competitive co-branded credit and debit card to the club’s 35 million Indian followers. The Bank will be offering fans of the club two types of the credit card 'Manchester United Platinum Credit Card' & 'Signature Credit Card'.